This piece is written by Matt Scott—the Chief Executive Officer at CauseMic. Revenue from monthly giving increased by an incredible 40 percent in 2017 (M+R Benchmarks 2018). This substantial growth speaks to the importance and popularity of these programs. Their inclusive branding and automation makes them not only the giving method of now—but the future. To build a modern monthly giving program, you need to convert your one-time donors into monthly donors. But before you launch a recurring campaign, you need to nail down the fundamentals: powerful design and compelling copy. Here at CauseMic, we’ve helped our clients raise more than $10 million on the Classy platform, and that includes developing modern monthly giving programs that leverage technology and nurture campaigns to generate thousands in recurring revenue each month. Here are five must-haves for your monthly giving program which delve into branding, persuasive language, visuals, proof, and programmatic impact. Nonprofits can build strong brands just as for-profit companies do. By naming your monthly giving program, instead of just calling it your “monthly giving program,” you further develop your brand. This in turn offers an opportunity for greater brand loyalty. And brand loyalty builds feelings of community and belonging which improve supporter engagement and donor retention rates. When you name your monthly donor program, it gives it an “official” feel and lends the program the sense credibility and memorability it deserves. Aim to come up with a program name that is in line with your larger brand. 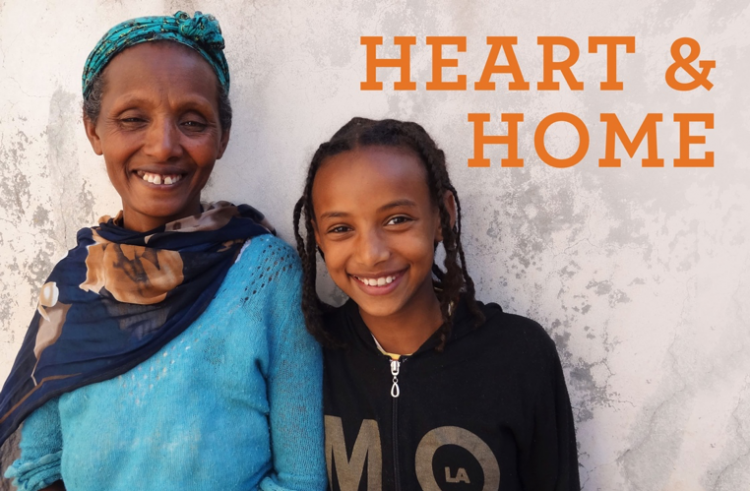 Why It Works: Selamta Family Project creates forever families for orphaned children and marginalized women in Ethiopia. Their deep passion for their mission shines through in their brand’s voice and tone. Selamta Family Project is not afraid to express their emotion and heart in communications to supporters. Because they create forever families, they’re really finding forever homes for orphaned children. Put these two ideas together and you get Heart & Home—a perfect encapsulation of their brand for monthly donors. For more inspiration, check out Pencils of Promise’s Passport, Liberty in North Korea’s Liberty, or St. Jude’s Partner in Hope. Your value statement tells your donors why they should give monthly. If the default giving method is a one-time gift, your organization needs to be ready to convince donors that monthly giving is a better option. Most organizations offer a (totally legit) rationale that’s some variation of: Monthly giving sustains our mission. It works because it’s true. With recurring gifts, you can avoid the drastic discrepancies that come with the ebb and flow of a development calendar and instead rely on predictable revenue. Get creative with how you say this and tailor it to your mission. If your nonprofit has the capacity and resources to provide incentives, follow your value statement with what donors will receive—tangible or intangible—for signing up. Incentives can be added motivation for some potential donors and can be anything from special branded swag to VIP event invitations to exclusive monthly donor communications. 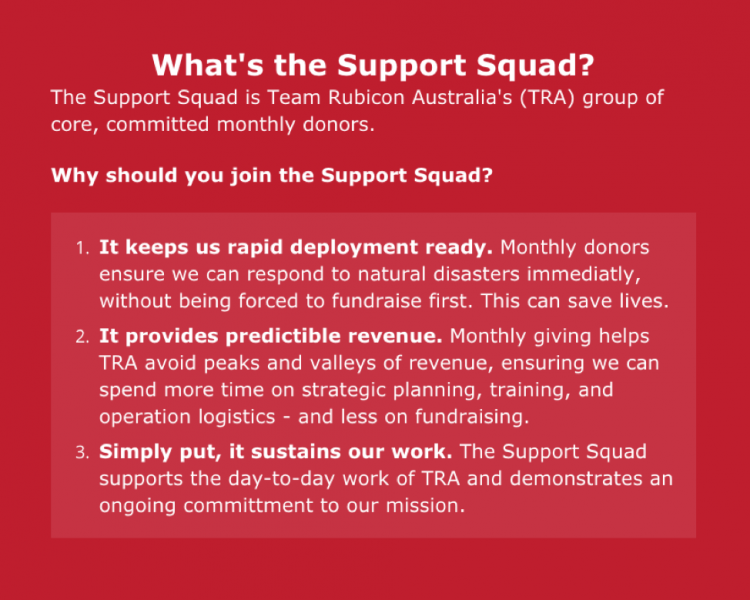 Why It Works: These statements and the additional explanations help donors understand the benefit of monthly giving, which in Team Rubicon Australia’s case can save lives. Give your monthly giving program the real estate it deserves on your website. If you want the program to grow, it needs to be highly visible and side-by-side with one-time giving. This will show donors that there are two possible giving options. However, you’ll likely want to dedicate more space to make the case for monthly giving, since monthly donors are more valuable to an organization. In fact, Classy’s recent report found the lifetime financial return of a monthly donor to be 440 percent greater than that of a one-time donor. You can do this by placing a “Give Monthly” button in your navigation bar next to your “Donate” button. The “Give Monthly” button can link to your program landing page, while the “Donate“ button can link to your one-time giving form. Operation Gratitude features their monthly giving program side-by-side with one-time giving, which positions The Brigade as a giving option on par with one-time giving. This encourages potential donors to explore and consider becoming a Brigade member. 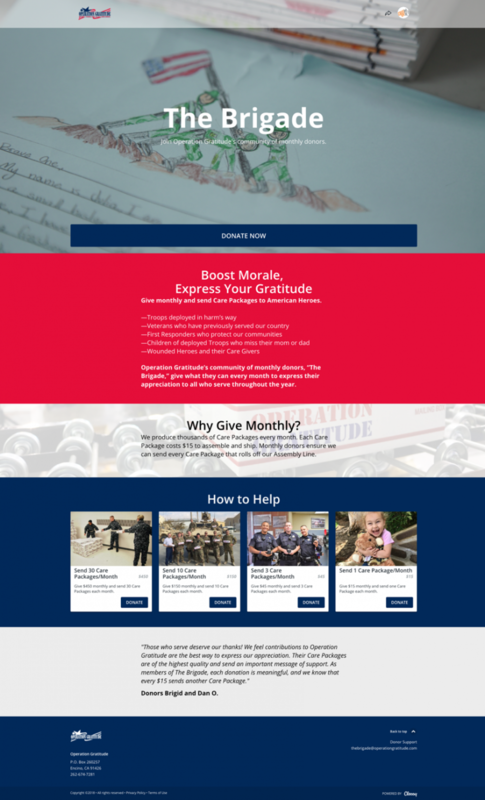 Once potential monthly donors end up on The Brigade landing page, Operation Gratitude uses persuasive language and shares reasons to join. Another way to encourage monthly giving is to give the option to make any donation a recurring gift on your Classy donation page. As humans, we’re wired to make connections. That’s why it’s important to cultivate a sense of community among monthly donors to your mission, you reinforce the identity of each individual, their values, and their relationship to your organization. Host events just for monthly donors to meet and mingle. Or, seat all your monthly donors together at your next gala. Host webinars or virtual meetups for monthly donors. That’s powerful, especially when you devote resources, such as a dedicated program manager, to reinforcing that identity and demonstrating impact to your monthly donors. Start by using consistent design and voice in your landing page content to maintain the feeling of community and emphasize the collective identity and impact of donors. You can also exercise some subtle social influence by sharing testimonials from existing monthly giving members. Quotes are compelling because they are essentially storytelling in the shortest of versions and individuals are often more easily influenced by stories than by facts and logic. TUSK USA’s Game Changers program was brand new when this page was built and while Liza couldn’t speak directly to giving monthly, she could speak to her deep belief in TUSK’s mission, and that’s still meaningful. If your monthly giving program is a hatchling, that’s okay. If you have an existing monthly donor willing to share why they give, that’s preferred, but if not, it’s still powerful to include a quote from a committed donor to support your monthly giving program launch. Just like you do with one-time giving levels, quantify your impact in monthly giving terms. Classy’s impact blocks are a great place to do this. This section helps donors understand the potential impact of their monthly gift. Instead of simply converting your one-time giving levels into monthly gifts, consider making separate levels for your monthly program to set it apart from one-time giving. Also, don’t be afraid to aim high and start monthly giving suggestions at your average one-time gift. While you may not convert every monthly donor at this level, it can increase your overall average gift size. Walk With Sally created meaningful giving levels tied to their impact so each monthly donor can better understand how their monthly gift makes a difference. We often hear nonprofits say they’re hesitant to provide giving levels for fear of restricting gifts to only those stated impacts. Or, sometimes they want to add the words “can provide,” which tend to water down the strength of the messaging. It’s our belief that posing a giving level is not a promise that funds will be used in that way, but it helps the donor imagine how their funds can be put to use. If donors would like to make a restricted gift, they should contact the organization directly to discuss it. The fundamentals of a successful monthly giving program are simple, but they require clarity of your organization’s brand, knowledge of what works (and why it works), and carefully crafted copy. Once you have your language in order, your next step is to custom-build a monthly giving page or create your Classy campaign. The team at CauseMic created all of the monthly giving examples noted above and would be happy to connect with you about building your monthly giving program. Plus, keep an eye out for our next blog in this three-part series about how you can convert one-time donors to monthly donors. Matt Scott is the Chief Executive Officer at CauseMic, a digital cause marketing and fundraising agency specializing in helping Classy clients leverage technology to scale fundraising and supporter engagement. For strategic help developing, launching, and managing your monthly giving program, connect with us at CauseMic.com.